Esthex comes to us from Esther Schuivens, a Dutch designer and mum of three. The label began in 2003 when Esther found an old drawing in her parents’ attic. It was of a girl named Sofie drawn by Esther at four years old, and it became the model for the first Esthex doll. The Esthex family now has a big range of dolls and animal toys, and Esther has just released her first wallpaper collection ($161), starring Harry the hedgehog on a native American adventure. 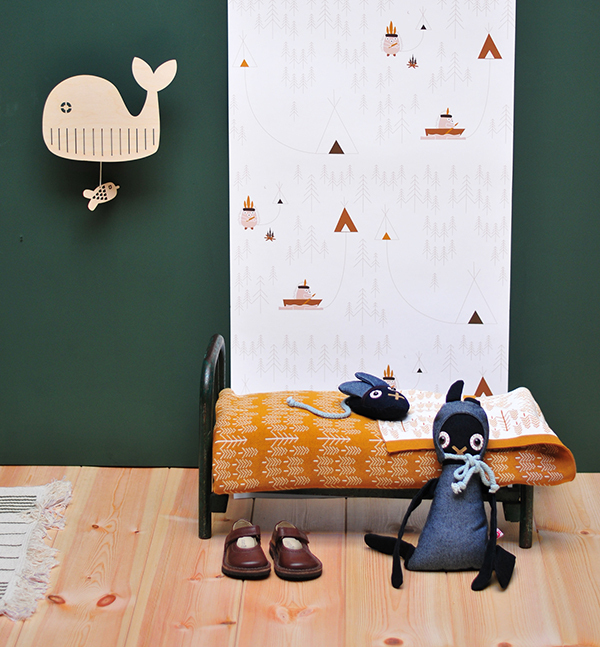 The wallpaper has a simple design with a forest of small grey trees, and the occasional tepee and campfire. It’s 52cm wide, which makes it perfect for a single feature panel, or to cover an entire wall. Esthex is also known for making lovely musical toys, like Walter Wood ($73), a birch sperm whale wall hanging that plays a lullaby when you pull a fish swimming below the whale. It’s neutral and sweet and will fit in with your child’s room long after they’ve outgrown the cot. Esthex is stocked locally at West End Products, but the wallpaper and Walter Wood are only available online from Europe. Shipping to Australia is $37.